I decided to make vegetable puffs but rolled the puff pastry and ended up making vegetable rolls..They tasted good and reminded those we get in bakeries in India.. Here is how I made them..
Thaw the puff pastry for half an hour or according to the package instructions.. Boil all the vegetables along with water..Mash them well..
Then add the boiled vegetables,chilli powder,garam masala and salt and mix thoroughly..Cook for one more minute..allow the cooked mixture to cool thoroughly. Dust the counter with some flour and roll out the puff pastry a little with a rolling pin..
Cut the pastry into rectangles or triangles depending on the shape of the puffs or rolls you desire to make..
Place the cooked vegetable mixture and close the puff pastry.. I cut the puff pastry into rectangles and rolled it from one end to form a roll..
Brush the surface of the pastry with a little butter/ghee so that it forms a nice golden - brown crust..
Preheat the oven to 350 degrees for ten minutes..
Bake the puffs for 30 minutes or untill they turn golden brown in colour.. The puffs are ready to be relished.. This is the first time I am being tagged...Really excited about it..Thanks to Coco of Ambrosia..
Was thinking for a while what to write about me..Here are a few facts my foodie friends do not know about me.. I have never entered the kitchen to cook before my marriage not even to help my mother in cooking..Was really lazy those days..Started cooking Only few months after my marriage when I came here to the US..But now I have developed the passion for cooking and have started experimenting with different cuisines.. I am a very much reserved person..I do not speak much to anyone whom I meet for the first time unless they come and speak to me..I am very sensitive and cry when i get angry.. I love designing mehndhi..I have won many mehndhi competitions in college.. I have a great fear for dogs..
Have learnt playing the guitar when I was at school.. These were the things that came up quickly in my mind when i was thinking what to write about myself..Thanks again Coco.. I have prepared this sundal with chickpea(bengal variety)..They are not the normal white coloured ones..They are dark brown coloured..I got this at the Indian store..Back at home we had this sundal along with curd rice..It tastes really delicious..Serves as a healthy snack too.. Here are some facts about this legume from Wikipedia..The chickpea, chick pea, garbanzo bean, Indian pea, ceci bean, bengal gram, hummus, kadale kaalu (Kannada), sanaga pappu (Telugu), chana or channa (Cicer arietinum) is an edible legume (English "pulse") of the family Fabaceae, subfamily Faboideae. The garbanzo is often used as a source of protein by vegetarians and vegans since it has one of the highest protein levels of all plants.Chickpeas are a helpful source of zinc, folate and protein.They are also very high in dietary fiber and hence a healthy source of carbohydrates for persons with insulin sensitivity or diabetes. Chickpeas are low in fat and most of this is polyunsaturated. Did you know that India stands first in the production of chickpeas? Ok..Here is how I prepared the sundal..It is a quick dish too..
Soak the chickpeas overnight or atleast 5 hours..
Pressure cook them with enough water until you get 3 whistles. In a vessel add some oil and allow the mustard seeds and urad dhall to splutter..Then add the finely chopped ginger and onions and saute them until they turn transparent..
Add the red chillies and salt..Now add this mixture to the cooked chickpeas and mix well..Also add the grated coconut and garnish with cilantro.. This can be quickly prepared and taken out for picnics..Hence I am sending this off to Travel Food Festival hosted by Simple Indian food.. I have an aversion to eggplants..So I use them only in preparing sambhars..My husband suggested this recipe and I tried it yesterday..It tasted really good..We had it with chapathis and it tastes good with pulao and ghee rice too..
Heat 2 tablespoons of oil in pressure cooker and fry a big sized sliced onion..Then, add around 8 to 10 cut small brinjals or 3 large eggplants..
After frying for 2 minutes, add the ground paste and fry for a minute. Now add 1 tablespoon coriander powder and 1/2 teaspoon Jeera/Cumin seeds powder and salt, keep frying for a minute. Take care to add a tablespoon of water if it gets sticky when frying the above. Now, close the cooker and leave the cooker to give one whistle. In the end after opening the cooker, add a tablespoon of beaten curd and add some chopped coriander leaves. The dish is ready to serve....Enjoy ! This goes off to Vegetable Of the Week - Brinjal hosted by Pooja.. This is my new invention..trying out a rice on my own..It turned out really well..Here is how I prepared it..
Wash the rice and soak it in water for 20 minutes to half an hour.. In a pressure cooker add ghee and roast the cashews..then add all the spices(cumin seeds,cinnamon,bay leaf,cardamom,cloves,mint leaves) and saute for two minutes till all the flavor comes out..Add the sliced onions and fry till they become translucent..Also add the ginger-garlic paste and green chillies..After they get cooked add the green peas and corn..Then add the soaked rice and mix them together..Add salt to taste..Add 4 cups water and cook until 3 whistles..After the pressure releases add the grated cheese and garnish with coriander leaves..If you do not like to add cheese add half cup of ghee.. 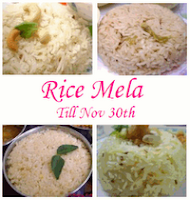 This rice can be served with any kind of raita.. This is a good tea time snack and can be munched on any time..It does not need much earlier preparation..It was prepared by my mom and packed while I went to hostel..Here is how I made it.. Mix the rice flour,gram flour,chilli powder,salt and butter with a little water,one spoon at a time..Mix them thoroughly until you get a flexible lump of dough..It should not be too watery or too dry.. Using the murukku press squeeze the mixture directly into piping hot oil..After two minutes,flip it on to the other side..Once they turn golden brown remove them from the oil and drain them on paper towels.. They are ready to munch on..
Bulgur or Daliya is a cereal made from several different wheat species..It is more nutritious than rice..It serves as a quick breakfast..The preparation is almost similar to the Rava Upma but it tastes a little different.. Melt the butter in a saucepan and roast the cashews..Then splutter the mustard seeds and urad dhall.Then add the onions and ginger and saute them..Once they become translucent add the vegetables and salt..You can add any veggies you like..Once they get half cooked,add two cups water and bring to a boil..Then add the bulgur and cook for 2 to 3 minutes or until the water evaporates..garnish with cilantro.. Serve with pickles or chutney of your choice.. Being a lover of sweets, this is my all-time favourite snack..It is usually prepared during special occasions..It does not take much time to prepare as well..My chithi is very good in preparing this and she prepares this each time I used to go home for vacation..Got this recipe from her.. Mix all the ingredients together and leave aside for 10 to 15 minutes..The amount of semolina, sugar,maida and water should be equal to get the desired panniyaarams..If you add more quantity of sugar or water there is a tendency not to get paniyaarams of proper shape.After 10 minutes with the help of a large spoon pour a little batter into hot oil..Wait for one paniyaaram to raise to the surface of the oil and then pour the next one..Or else they might stick together..Cook on each side for about three minutes or until they turn golden brown..Do not keep the flame too high as the inside part might not get cooked properly.. Serves as a good snack..
Sending this to Think Spice:Think cardamom hosted by Easycrafts..
Fried rice can be prepared in several ways..You can add any vegetable/ingredient according to your liking and availability..I love the various colurs of the veggies in the rice..This can be prepared if you have leftover rice..It is very simple to prepare..It took less than 20 minutes for me to prepare this..
Cook the basmati rice with 4 cups water.. Meanwhile, in a saucepan add the oil and fry the onions..Once they turn soft and translucent add the ginger garlic paste and green chillies and saute for a minute..Then add all the vegetables,salt and pepper..Sprinkle very little water and allow the veggies to cook for two minutes..They should be half cooked..Now add the soya sauce and chilli sauce..
Now add the cooked rice to this vegetable mixture and stir this mixture for a minute or two in low flame..Roast some cashews and raisins in ghee and also add them.. If you dont like the sweet taste you can omit the raisins.. Your fried rice is ready.. It tastes good when served with gobi Manchurian..Or just tomato sauce and raita will do.. This is my entry for My favorite Things - Chinese Food hosted by Bindiya..
Cinnabun Roses For Valentines Day.. I call these Cinnabuns because these buns have Cinnamon in them..Also they look like roses and would be perfect if I call them Cinnabun Roses.. I adopted this recipe from Paula s Home Cooking telecasted in Food Network..
Dissolve the yeast with a little warm water and leave it for 5 minutes...To this add 1/4 th cup of sugar,egg and the flour and knead well so that it forms an elastic dough..Cover the dough with a cloth and leave it in a warm place for half an hour..The dough must have raised and increased in volume by now..
Dust the countertop with flour and roll the dough into a big rectangle..It should be approximately 15 into 9 inches..It need not be an accurate rectangle..Now brush the whole surface of the rolled out dough with melted butter.. Mix 2/3 rd cup of sugar with the cinnamon powder and sprinkle it all over the dough..Also sprinkle some raisins and walnuts..
You can also use any other dried fruits and nuts.. Roll the dough using your hands from the smaller end until you reach the other side..
Now cut the dough perpendicularly of about one and a half inch thick..
Place them on a baking sheet and bake at 350 degrees for 30 minutes.. Mix the 2/3 cup of sugar with the butter and water and brush this mixture on top of the cooled buns.. This entry goes to Theme of the week-Valentine's Day hosted by Pooja.. I was indeed astonished to find bell peppers in various colours when I came here to US.. They are really appealing...So I bought one bell pepper from each colour and decided to make a curry out of it..Here is how I made it.. Dice the onions and bell peppers into small pieces..
Take oil in a saucepan and splutter the mustard,urad dhall and cumin seeds..Then saute the onions for a minute and add the tomatoes..Once they cook add the turmeric powder,chilli powder,curry powder,coriander powder and mix well..After a minute add the tamarind paste and salt..Add water according to the consistency required.. This is an easy snack to prepare..It hardly takes ten minutes..It can be served during tea.. I have tried this with multigrain bread and wheat bread..it tastes good when prepared with any kind of bread.. Melt the butter and add the sugar and cinnamon powder..Mix them thoroughly..
Now cut the bread into any shape you want..Apply the mixture on both sides of the bread with a brush or a spoon..
Place it on the microwave oven's plate and microwave high for about 5 minutes or until they turn crispy..The aroma of the cinnamon is really great! These can be stored in an airtight container for several days.. This is an easy dish to prepare..Cabbage is rich in Vitamin C an also proteins..There are several varieties of cabbage and I used the white variety to prepare this.. Finely slice the cabbage..Also dice the onions..Half-cook the dhall using a little water..
Take some oil in a saucepan and splutter the mustard seeds and urad dhall..Then add the diced onions and cook until they turn soft..Add the sliced cabbage and channa dhall with very little water...Add chilli powder and salt and stir..Close it with a lid and allow it to cook for 4 to 5 minutes..The cabbage reduces to almost half its size once it geys cooked..Do not overcook..Add some grated coconut and serve. I served it along with dhall and rice.. Wondering what these vadai's are made of ! Yes, of course they are made with dosai maavu..It is a quick snack which my mother prepares..It can be prepared when you have very little leftover dough after preparing dosas..
To the dosai dough add the gram flour until you get a good thick consistency to make vadais..You will need to add a little more or less than one cup of gram flour depending upon the water content of the dosai dough..Also add the onions,chilli powder,asafoetida and salt and mix thoroughly..Take oil in a frying pan and pour a little of the dough with a large spoon..
Let it get cooked till the inside..It will take approximately 2 minutes on one side..Now flip it to the other side and let it cook..Once they turn golden brown remove them from the oil and place them on tissues to drain the excess oil.. It serves as a good snack during tea..You can also serve with tomato sauce or a chutney of your choice.. I remember the first time I tasted Hummus..It was in a Greek restaurant where they served Hummus with pita bread...It was of the classical type..I also like the seven-layer hummus from Trader Joes..I searched for the recipe and got several ways to prepare it..I was surprised to discover that it was made using chickpeas..The one we use to prepare channa..I prepared it the classical way..It is very easy to prepare and it can be served along with snacks especially tortilla chips,lavash,pita bread etc..My husband likes to have it with carrots..The tahini/sesame seed paste adds a great flavor to it.. Here are some facts from Wikipedia about Hummus..Hummus or hummus bi tahini (Arabic: حُمُّص‎ , Hebrew: חומוס‎) also spelled hamos, houmous, hommos, hommus, hummos, hummous or humus) is a dip or spread made of blended chickpeas, sesame tahini, lemon juice, and garlic.As an appetizer and dip, hummus is traditionally scooped with flatbread (such as pita) but it is increasingly eaten with tortilla chips and crackers of various kinds outside the Middle East. Hummus is also used as part of a meze, as a sandwich filling and as a dressing (for such things as falafel, grilled chicken, or eggplant). Hummus can be garnished in many ways. Popular garnishes include parsley, sumac, pickled turnips, cumin, pine nuts, chopped or thinly-sliced tomato, cucumber, cilantro, sautéed mushrooms, whole chickpeas, olive oil and hard-boiled egg.Hummus contains large amounts of the nutrients iron, vitamin C, and is a good source of protein and dietary fiber thanks to its primary ingredient. Depending on the recipe, it contains varying amounts of monounsaturated fat.Hummus is useful in vegetarian and vegan diets: like other combinations of grains and pulses, hummus with bread provides all essential amino acids for humans. Soak the chickpeas in water overnight..In the morning you will find them doubled in size..
Cook the soaked cookpeas in a pressure cooker along with the garlic pods until they turn soft..three whistles in a pressure cooker should be good enough..
You will have to remove the skin of each chickpea now..It is really a time consuming process..But it is worth it because it yields a very smooth texture to the hummus..You can also skip this peeling step but your hummus might be a bit coarse..
After you are done with the peeling process grind the chickpeas in a mixer or blender along with the garlic,olive oil and salt.. Mix it with lemon juice.. This can be relished as such or you can flavor it according to your taste by adding anyone of mint,cilantro olives etc during the grinding process..
You can refridgerate this and use it for about a week.. This goes to JFI conducted by The Spice Cafe.. This is an authentic North Indian Breakfast..I learnt this from my mother in law who is an expert in making preparing them..It might be a time consuming process but really is worth it.. It can be relished with no special side dish..Only Tomato ketchup and curd is enough to relish this aloo paratha..
Knead the wheat flour with a teaspoon of oil and required quantity of water to form a dough.Using warm water while kneading gives soft parathas..Leave the dough for half an hour..
Meanwhile,cook the potatoes well using a pressure cooker..Once they cool, peel them and mash them into a fine paste without any lumps...Mix the mashed potato with the garam masala,salt and cilantro and divide them into equal sized balls..The balls should be of the size of a lemon..
Now divide the dough into equal quantities and make them into small balls..
Now roll out each ball of the dough into circles of about 7 to 8 inches diameter using a rolling pin..Place each potato mixture ball over the rolled out dough..
Bring the edges of the dough to the centre to form a dumpling..Press it at the centre to seal the dough such that the filling does not come out..
With the help of a rolling pin carefully roll out the dough to about 7 to 8 inches diameter..You can use extra flour on the rolling surface so that the dough does not stick to it.. In a tawa, add a teaspoon of ghee and place this rolled out dough-potato mixture. Let it cook for a minute..Then flip it on to the other side and spray some ghee..Let it cook for a minute..It will turn to a brownish colour.. This is my entry to Ode to Potato hosted by Sia of Monsoon Spice ..
and also to Flatbreads hosted by Chili and Ciabatta.. I always wanted to try pasta in an Indian way..So just tried it on my own..It turned out well..It just took me ten minutes to prepare the dish and it needed very few ingredients..Hope u like it.. Pasta of any type - 1 cup..You can choose the one you prefer. Onion - 1/2 finely sliced..
Add the pasta to boil water along with a tablespoon of salt and cook according to the package instructions..Drain the pasta and keep it aside.. In a saucepan, add the oil and finely sliced onions and saute until they turn translucent..Then add the ginger garlic paste,garam masala and salt..Cook for one minute or so..Mix the corn flour with the milk and add it to the cooked mixture..Garnish with cilantro..Finally add the cooked pasta and serve with tomato ketchup.. In the final stage you can also add some grated cheese and serve.. This is one of the dishes I learnt from my mother-in-law...It is mostly found in North Indian menus especially served with rotis and chapathis..In assam Rajma-chawal(rice) is a standard food.. I happened to prepare it for dinner with chapathis and it came out really delicious..Here goes the recipe..
Pressure cook the rajma until you get three whistles or until they turn soft and cook completely..Do not add salt while you cook the rajma in the pressure cooker as it tends to harden the beans..You can use canned kidney beans too.. In a saucepan take some oil and cumin seeds..Once they start spluttering add finely cut onions..
after they become soft add the dice tomato.. Mash them well..after it has cooked well add the ginger-garlic paste..After a minute add all the powders and saute for a minute..Add salt to taste..
Then add the cooked rajma and stir well..You can add water to obtain the required consistency.. Finally garnish with coriander leaves and serve..
Initally dissolve the active dry yeast in a tbspn of warm water and leave it aside for a couple of minutes..In a large bowl add the yeast,the egg white (do not add the egg yolk),milk,sugar,salt and the oil and mix well..Now add the flour little by little and knead with your hands to form a dough..you can use extra flour if needed..The dough should not be very sticky..
After preparing the dough divide it into 8 equal balls..Roll each ball into a circle of about 7 to 8 inches diameter with the helap of a rolling pin..Do this for all the 8 balls..Now place the first rolled circle on a greased base..Apply some ghee/melted butter on the surface and place the second circle on top..Do this for all the 8 circles by stacking one on top of the other...After you are done roll out the stacked dough together into a large circle..it will turn out very big..i used my kitchen's countertop..
Then using a butter knife divide the large circle into small triangles..You will get 12 to 14 triangles with the dough quantity specified..
Leave this for about 10 minutes for the yeast to work..
in the meantime prepare the filling..
make the sugar syrup by adding 1 cup sugar to 1/4 cup water and allow it to boil.. The solution thickens and forms the syrup in about 10 to 15 minutes..to the syrup add the shredded coconut and mix well..Allow it to cook for 5 minutes..The filling is ready now..
Take a tbspn of the filling and place it on the wide edge of each triangle..Start rolling the triangle from the wide edge till the top..Do this for all the triangles.. Beat the egg yolk and just brush a layer of egg over each rolled triangle..This gives a nice golden color and shine to the puffs..After 10 minutes place the puffs in greased baking sheet..Place it in a preheated oven at 350 degrees for 20 to 25 minutes or until they turn to a brownish color..
Sweet coconut puffs are ready..They taste best when served hot.. This entry goes off to Click - Flour hosted by Jugalbandi.. This is of course a healthy dish because it contains spinach and dhall...It is hence rich in protein and Iron.. In a pressure cook add the toor dhall, spinach and the tomato..Fill with water such that it covers all the ingredients..Add a pinch of turmeric powder and a little oil and cook until u get 3 whistles.. When the pressure in the cooker is completely released, open it and mash all the ingredients well...Add a pinch of salt.. This tastes good with piping hot rice or chapathis.. This is my entry for the Weekend Herb blogging(WHB) hosted this week by Ulrike..